This Outrageous Orange Salad combines wild rocket, baby spinach, orange segments, pickled carrot, cucumber sheets and caramel walnuts bound in a roasted coriander seed and orange dressing and fresh coriander leaves is a healthy but tasty choice from the menu at Rustic Stone. High in vitamin C content, it promises to reduce tiredness and fatigue. 1. Place the orange juice, zest and sugar into a heavy bottom pan and reduce until sticky. Skim off any impurity that comes to the surface. 2. While the reduction is still warm put it in a jug blender on full speed and slowly add the vinegar, water and oil to make an emulsion. 3. Add the zest from four oranges and the juice of two. 4. Fold in the warm crushed coriander seeds. Let rest for at least a day before you use it and do not refrigerate. Add all ingredients into a small saucepan, bring to the boil and pour over carrot strings. Leave to cool. In a large salad bowl, add all the salad ingredients. Season with salt. Add the coriander, tarragon, pickled carrot strings and walnuts. Add the orange dressing to coat the leaves and a squeeze of lemon juice. Dylan McGrath was born in Dublin and raised in Belfast. He studied in Portrush Catering College and Belfast Institute. He began his first Job in Jurys Inn, Belfast and then left to work in Roscoffs, Northern Irelands only Michelin starred restaurant. He also worked at The Commons Restaurant and Peacock Alley with most of his culinary skills being acquired at John Burton Race in L’Ortolan and Tom Aikens in Chelsea where he became Head Chef. Dylan opened Rustic Stone in August 2010 that is a casual dining, contemporary restaurant which delivers on the flavours Dylan is so passionate about but without the formality he previously would have been associated with. From Rustic Stone, the Raw menu has emerged, which was developed by Dylan keeping his ethos on nutrition and flavour to the fore. 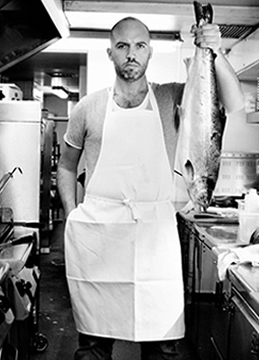 To find more about Dylan and his restaurants visit www.dylanmcgrath.com.